The days are slightly warmer and the sun stays in the sky a little bit longer each day. Winter will soon be but a memory to be stored away for next year. With spring blooming on the scene, there are several critical steps every pool owner should take to ensure a fully prepared pool can be opened for the start of the swimming season. -Before you remove the swimming pool cover, be sure to gather any collected debris so that it doesn’t get into your pool. Also, if there’s any standing water from recent rain or runoff, try to pump it off! -The cover should be cleaned, dried, and stored safely for use next winter. -If you notice that your pool water is below normal levels, add water and bring up to its proper level. -Any items or equipment that protects against inclement winter weather like freeze plugs should be removed and stored for safekeeping. 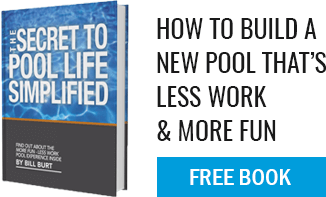 -It’s best to also make sure that your pool filter is clean before starting up any equipment! After removing any materials, turn your filter system on and check for any leaks. -The water quality is the next thing to address, after removing any large plant debris that’s made it’s way into your pool, all dirt and algae should be sucked up with your pool vacuum. -For the water chemistry, let your systems run for approximately 8 hours before taking a reading on the current chemical levels. This can be done with an at home kit, or you can take a sample of water to your local pool professional store. You should test for pH, total Alkalinity, and Calcium Hardness. -After understanding what your current water chemistry is, add the necessary chemicals to balance your pool. Give your pool a days rest or so in order to circulate the chemicals. -While this is happening, inspect the surface area, pool tile or plaster, all equipment, and toys used in the pool and make sure that nothing aged or broke over the long winter. Once done with this, you should be good to go to enjoy your pool! After a long winter of snow and ice, it’s great to look forward to that first hot spring day when the water is warm enough to jump in. Follow these steps or talk to one of our professional staff members at Aqua Pool about more detailed steps to ensure a problem free, season opening pool day!